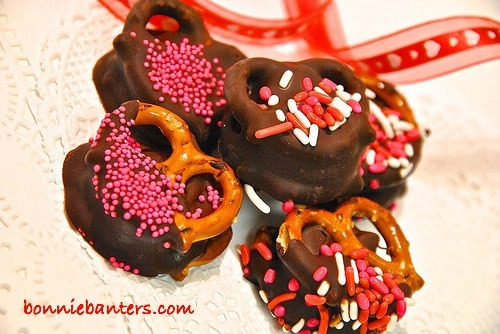 Bonnie Banters: Chocolate-Coated Peanut Butter Cup Pretzel Bites ~ Salty, Chocolaty and Crunchy! Line an approx. 15 1/2" x 10 1/2" jelly roll pan, or shallow baking pan, with parchment paper. Place 24 pretzels, about 2" apart, onto the lined baking pan and top each with a (face up) peanut butter cup. Place in the oven and cook for about 2 minutes, or until the peanut butter cups start to melt. Melt the chocolate baking chips: For this project, I prefer melting the chocolate in a double boiler over very low heat and (especially during cold weather) holding for dipping off the stove over a bowl or pan of just warm water. (It's critical to avoid getting any water or steam whatsoever in the chocolate.) However, you can melt the chocolate in the microwave, if you prefer, per package directions. Click here for a good tutorial from King Arthur Flour for melting, tempering and holding chocolate for dipping. Using kitchen tongs (ideally with small, silicone tips) dip each pretzel bite into the melted chocolate and tap on the edge of the bowl or pan to remove any excess chocolate. (You can dip the entire pretzel bite or just half of the bite, leaving some pretzel exposed.) Place back onto the baking pan, lined with fresh parchment paper,* and sprinkle lightly with any toppings you prefer. To harden, put in the freezer for approximately 15 minutes, or in the refrigerator for about 20-30 minutes. I lined the baking pan with fresh parchment paper in each step. A minimum of 12 oz. (or 2 c.) chocolate chips stays melted longer. You'll actually use closer to 1 c. of chips for this recipe, so you'll have leftover chocolate (use for dipping potato chips or extra pretzels, etc.). I experimented with dipping the entire pretzel bites into melted white chocolate and that did not work for me, as the chocolate on the peanut butter cups blended with the white chocolate coating. Maybe my white chocolate was too hot, or I didn't work fast enough? I had better success with dipping the pretzel bites into the dark chocolate, and I see no problem with using milk chocolate. I think milk, dark or white chocolate drizzled onto the pretzel bites as a topping would all work fine. Delight a loved one with these fantastic mini desserts as a gift in a pretty, doilie-lined tin, serve at a party or just pamper yourself and enjoy!